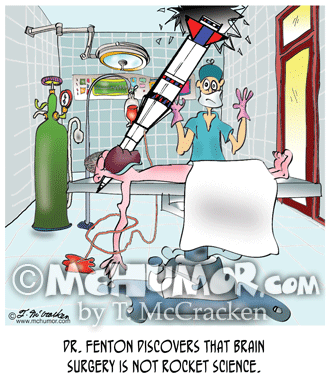 Surgery Cartoon 8815: "Dr. Fenton discovers that brain surgery is not rocket science." 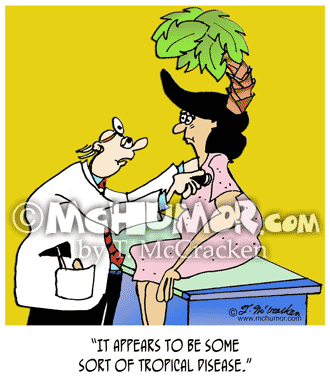 A doctor is startled by a rocket that has crashed through the operating room and is in a patient. 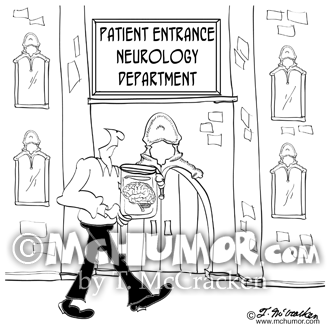 Neurology Cartoon 8883: A man with a hole in his head carries a brain in a jar outside the "Patient Entrance, Neurology Department." 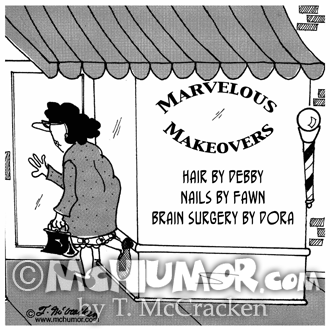 Beauty Cartoon 4795: A shop with a sign, "Marvelous Makeovers. 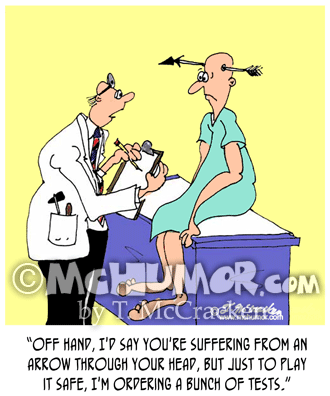 Hair by Debby, Nails by Fawn, Brain Surgery by Dora." 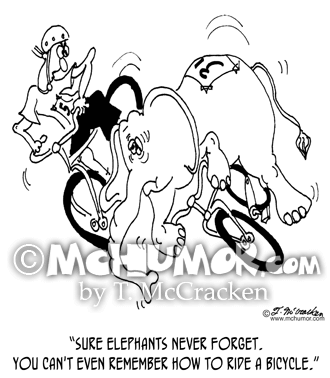 Disease Cartoon 6737: "The Mnemonic Plague." 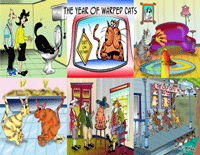 Confused looking people are reciting incorrect phrases: "A before q, except after y?" 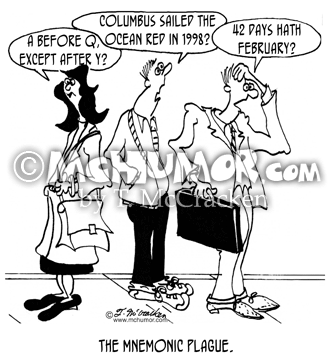 "Columbus sailed the ocean red in 1998?" 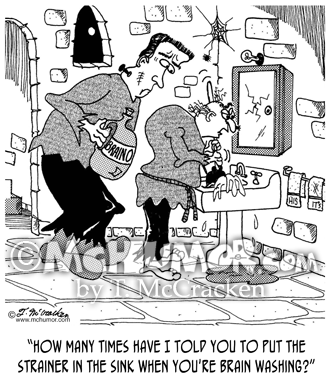 "42 days hath February?" 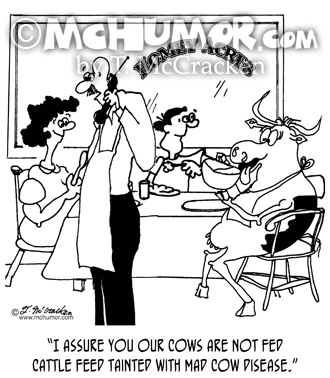 Beef Cartoon 7435: As a cow eats at a family's dinner table a rancher on the phone says, "I assure you our cows are not fed cattle feed tainted with Mad Cow Disease." 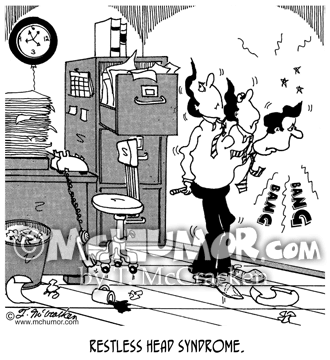 Medical Cartoon 8241: "Restless Head Syndrome." A man bangs his head against a wall.